During a debate with my friend on the existence of the soul, he raised ghost sightings as an argument for the soul’s existence. While I quickly refuted his argument, it led me to consider writing a naturalistic explanation for ghost sightings, since they’re frequently used when spiritualists argue against naturalists. I’ll start with pareidolia, a common psychological/neurological phenomenon. Did your friends ever said to you: “I saw a ghost when I was walking to the toilet with my own eyes”? Or have you ever heard someone calling your name, but there’s no one around? 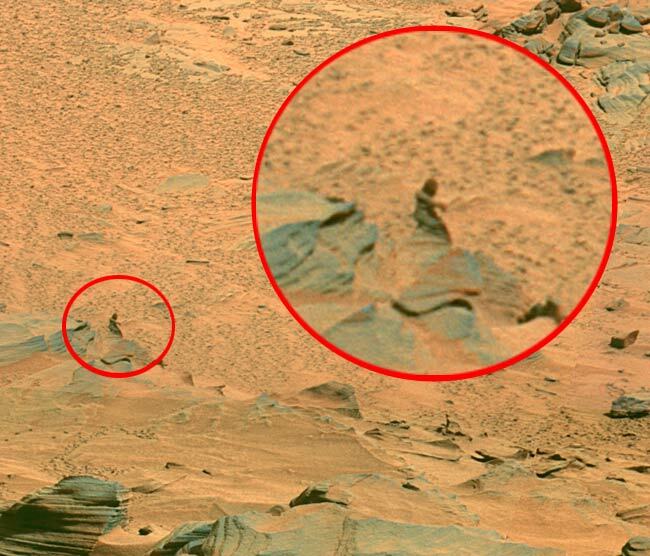 Meet pareidolia, the tendency to interpret a vague stimulus as something known to the viewer; such as interpreting marks on Mars as canals or seeing shapes in clouds.This phenomenon is extremely common, and can be created easily. Lets see…. That's an alien on Mars...... or is it? That may be an alien disguising as a tree sticking its tongue towards us... Yeah that's obvious. 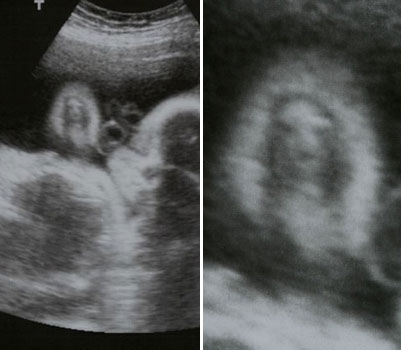 In addition to the ghostly female face, I also see the head of an avian-like monster beside the face, and a ghost with eyes, hands and a mouth at the centre-right of the 1st image. Something’s definitely wrong, or I simply have a great imagination. I bet you saw the faces. And if you did, congratulations, for you're a normal human, and like all of us, susceptible to illusions and pareidolia. So if you see a ghostly apparition, don't worry - it's your mind seeing an image that vaguely resembles something you’re familiar with, in which your brain then exaggerates and modifies to be clearer. The brain is a gifted interpreter – it’s capable of responding to blurry face-like images and interpreting them rapidly – in fact this study suggests that it takes only 165ms for our ventral fusiform cortex to be activated, compared to 130ms for a true face. This study shows that pareidolia is an instinctive response, and not a late cognitive reinterpretation phenomenon. Despite that, our first instincts are often wrong, and when the same object is looked more carefully and with more detail, it’s often revealed that the so-called “ghost” is an illusion after all. 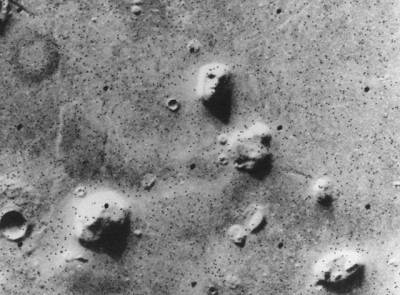 The best example for this would be the “Face of Mars” in the Cydonia region. 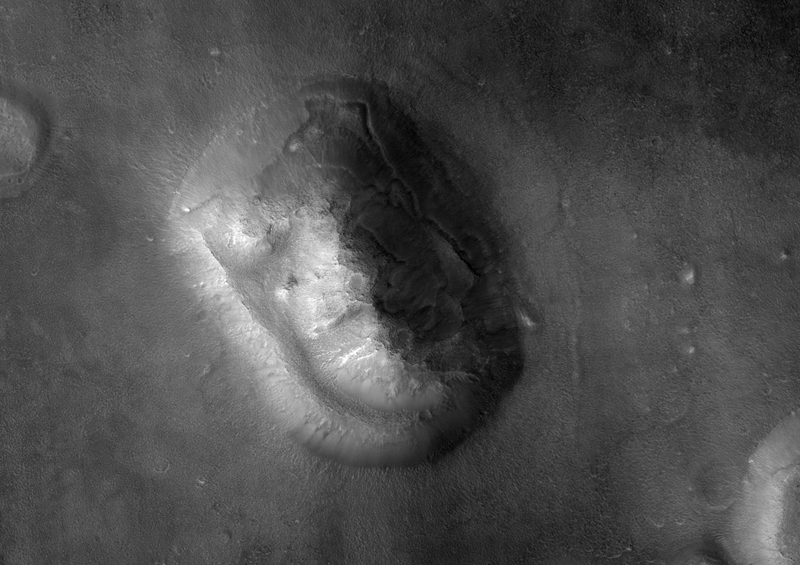 Here's part of the Cydonia region, taken by the Viking 1 orbiter and released by NASA/JPL on July 25, 1976. And yes, that's the so-called face of Mars near the top. Upon seeing the “face”, conspiracy theorists claimed that it was “intelligently designed” by Martians, and that it was located next to a city whose temples and fortifications could be seen. On the other hand, NASA and the skeptics explained that it was simply the effects of light, but the conspiracy theorists took that as a sure sign of a cover up. Until the high-res images appeared. High resolution Mars Reconnaissance Orbiter (2006-present) image of the "Face on Mars". Taken using the onboard HiRISE camera. Similar high-res images were took by the NASA’s Mars Global Surveyor (1997-2006) and the European Space Agency's Mars Express probe (2003-present). All wild speculations about the “face of Mars” were put to rest, and the conspiracy theorists went silent (if not embarrassed). However, this is not the first case of pareidolia caused by vague stimuli, and will certainly not be the last. Sometimes, the stimuli doesn’t have to vague/blurry - pareidolia can also happen when you’re aren’t fully self-aware (half awake, fatigued, sleepy etc). When we’re not fully conscious, our brains tend to misinterpret things, and pareidolia can occur easily. That’s why ghosts love to come out at night, or when you’re working overtime, or when you wake up at night. Yeah, makes perfect sense. Since pareidolia is literally hardwired into our brains, there must be a evolutionary advantage for our brains to see "faces" or hear "voices" when there are none. A plausible explanation is the false-alarm hypothesis (or whatever it’s called). Let's assume that there're 2 individuals, A & B living in the wilds of yesteryear. A is able to respond to familiar stimuli (faces, animal voices) quickly, but is susceptible to pareidolia; B doesn't respond as well, and thus never have any false alarms. In the prehistoric world (perhaps even in the modern world), A would be much more likely to survive by recognizing familiar patterns quickly, and escape on the first sign of a threat. Even it was a false alarm, it wouldn't affect A negatively. B, on the other hand, failing to recognize patterns quickly, would be less self-aware, and fall prey to sabre-tooth tigers easily. On a not-so related side note, I propose that we fear ghosts because they look so damn similar to the predators our ancestors had to escape from at night – blurry, vaguely resembling things we’re familiar with, making all sorts of noises, and yes, their ghastly eyes. Those who were afraid of the predators survived, while the others left offspring. Thus, when we see similar images in our lives, we still invoke a “fight or flight” response and get freaked out. Here, I’ve put forward pareidolia as the first of my explanations for ghostly encounters, and there’s going to more. I just hope that my friends would try and take a look at my explanations, instead of simply repeating the same-ol’ argument every time. I bet they won’t though. How about you, my fellow readers? 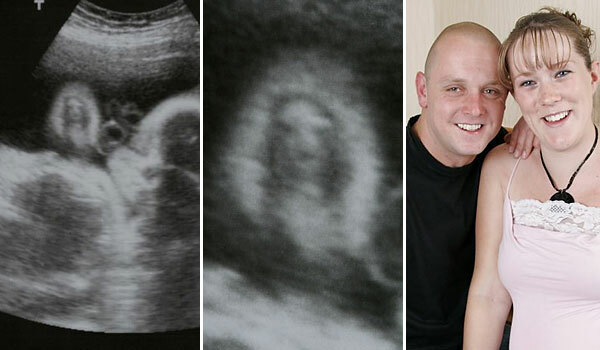 Do you think that pareidolia manages to explain some, if not most ghost sightings? If it can’t, then why is it so? For ghosts; no. Pareidolia can explain allot of things but ghosts have more to do with the alleged haunted places and a persons mind set. Many places that are thought to be haunted are creepy. That creepiness along with the human imagination and a belief in ghosts or spirits (and maybe a lack of sleep (allot of people that go looking for ghosts often do so it night)) could make people think there is a ghost near them. Add to that the fallibility of human memory and you can go from "I felt a presence" to "I saw a ghost!" I have a little anecdote on the subject: I once had a room that was creepy. My mother thought it was haunted, my grandmother thought it was haunted, I didn't believed in ghosts. The room was creepy. Sometimes I would feel a presence in the room, sometimes when I was trying to get to sleep I would feel like there was something behind me. Instead of assuming the room was haunted I went to with most logical explanation: the creepiness of the room plus my imagination. Of course its just an anecdote but it can be used to show how different mind sets will interpret the creepiness of a place differently and how people can assume something is supernatural rather than just creepy. Lone Wolf: Actually, your point about "human imagination" and "interpretation" is pareidolia. Yes, I certainly agree that a belief in ghosts can make you see "things" more easily, and that our memory is fallible, but the point still holds - seeing ghosts still requires imagination at times, which is pareidolia. Let me given you an anecdote (nope, no empirical evidence for you): My friends and I confess to hearing our names called out when there are no one around. They said that those were ghosts calling us. So one day, I was at home with my Mum, and she was in the bedroom, while I was in the living hall. Suddenly, I heard my name called out, so I asked my Mum why she called me, but she said she didn't. The ghost hypothesis came to mind, but I settled down with more logical explanation: either I was hallucinating (I doubt that, since it was in the afternoon, and I'm pretty awake) or it could my mind misinterpreting the sounds of a group of guys talking outside my house. If that's true, then I just had pareidolia. Plus, my friend said that he and his other friends always see ghosts in the jungle (or was it? I'm not sure) nearby during camping trips. Every single time (though that is almost certainly an exaggeration). I don't think hallucinations can explain this, since you're talking about mass hallucinations happening on every single camping trip, which is improbable. However, a combination of pareidolia (imagination, misinterpretation, exaggeration of the mind) plus the power of suggestion (creepiness of the jungle, strong belief in ghosts, friends that get freaked out) could be the cause of it, since it can be repeated easily. That's my view, anyway. I'm currently halfway through a book called "Supersense" by Bruce M. Hood, an evolutionary psychologist, which talks about the origin of our supernatural beliefs and how the brain is wired to see ghosts and think in anamistic terms. Another good book on the science behind the concept of the soul and spirits is "Spook" by Mary Roach. I think you are 100% right. Well written ! I have read Supersense -- great book, eh? Shows how we are ALL susceptible to cognitive illusions, all the time. Tristan: Thanks for the suggestions! I'll take a look at those books if I can find them in any bookstores nearby. 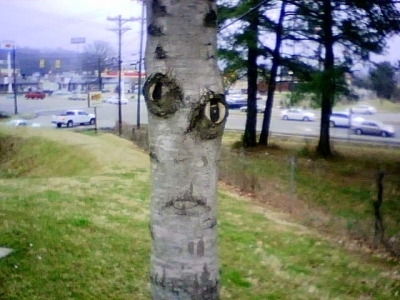 Sabio: I'm looking at your 1st post, at it's quite unique, since I don't remember seeing any skeptic writing about the benefits of pareidolia :-). On the other hand, your second link doesn't work, as it links to the same page. You know you've said something stupid when you facepalm yourself. I usually think of peradolia as an auditory of visual thing.